In keeping with the Acquistapace tradition of providing the best of every product we offer, our markets feature a wide variety of the finest cigars on the market. Be sure to visit and explore our walk-in humidor, where you’ll discover a cigar that effortlessly complements your drink, meal or activity of choice. ACID: Handmade in Nicaragua, the ACID brand boasts a vast range of cigar lines, making it easy to find a favorite, whether you’re a cigar veteran or newcomer to the scene. Arturo Fuente: With flavors ranging from medium to full-bodied, the Arturo Fuente name is famed for the exquisite quality of its many cigars. Casa de Garcia: Available in several distinct blends, Casa de Garcia cigars are known for their smooth, consistent feel. Churchill: Churchill cigars are inspired by the endlessly bold character of Winston Churchill himself. They’re available in a variety of blends and wrappers to cater to the discerning buyer. Gurkha Cellar Reserve: Crafted with Dominican fillers and binders, these vintage cigars come packaged in a unique wooden box that reflects their exceptional flavor. Macanudo: Macanudo, known for products handcrafted in Santiago and aged in cedar rooms once rolled and wrapped, offers several bold-flavored cigar lines. 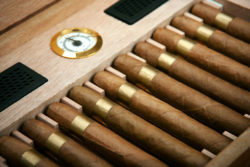 My Father Cigars: Established in 2003, My Father Cigars has quickly become one of the most well-known names in the industry thanks to unique blends boasting both strength and spiciness. Oliva: While Oliva traces its distinctly Cuban roots back to 1886, this renowned brand’s high-quality cigars are now grown in the fertile soil of Nicaragua. Rocky Patel: A keen attention to quality helps this boutique brand’s distinguished cigars rack up universally high scores in key cigar publications. The Bourbon Cigar: Maker’s Mark bourbon whiskey and Cuban-seed, Dominican tobaccos lend these cigars an unparalleled flavor profile. For your go-to cigar store in Louisiana’s Northshore region, look no further than Mandeville Wine and Cheese. Stop by during business hours to choose your perfect cigar, and be sure to pair it with a delicious drink from our equally exceptional selection of spirits.